The Big Green Egg has been in existence since it hatched in 1974. It’s creator, Ed Fisher was inspired by ancient Asian-style ceramic cookers, and saw potential for Bbq. With some tweaking, he created an interesting and extremely versatile, he took the kamado-style, and made it a modern marvel. Originally, Fisher used clay for the base. With an open mind to technology, it was soon replaced by space-age ceramic materials, that were designed to be tailored to the needs of Big Green Egg. This change allowed for an exterior that is practically invincible to all elements and cooking conditions. Today, they are adored amongst customers for their ultimate convenience, easy maintenance, amazing ability to cook and grill deliciously, and the fact that they can last a lifetime. Some of the reasons people adore their Big Green Eggs with a passion are because they provide a great alternative to traditional bbq grills, while still doing the same job, with superb results. They light quickly, require no lighter fluid, and are ready for cooking in 10 minutes. Because of their ceramic construction, they retain heat much better than traditional metal grills. The temperature control is excellent, and always accurate, without creating hot spots that can mar a perfect grilling. Their ceramic structure is weatherproof, defying the elements, rust, and can be used no matter what the weather delivers- rain or freezing temperatures. From 0 degrees, to 1800 degrees, the Big Green Egg can handle it without worry, and will still perform to your satisfaction. During grilling, the exterior remains cooler that metal grills, and is a safer option around children and pets. When esthetics are concerned, Big Green Eggs are a fantastic alternative to regular grills because they are simply gorgeous. The green ceramic design lends itself easily to outdoor décor, and makes for an awesome conversation piece. Being weatherproof, you can leave yours outdoors no matter what the elements, without concern for its safety. As the name may indicate, they are also an eco-friendly option to regular bbq grills. Big Green Eggs are made to last a lifetime; so you will not be replacing it every few years. Grill repair can be done as needed, so you can keep your grill running smoothly for many years. They utilize fuel very efficiently, and you never need to add additional charcoal as you cook, avoiding waste. Compared to regular grills, they use far less charcoal and/ or wood for cooking. Unused/ unburned charcoal can then be used again. When it comes to grilling and cooking, most users never revert back to traditional grills because of their unbelievable results with the Big Green Egg. They have an unmatched ability to retain moisture- producing tender, juicy, and succulent foods. A Big Green Egg can be used to grill, smoke, and bake- allowing you the ability to cook everything from meats, to vegetables, full meals, appetizers, and even desserts. When you factor in that you can use it all year, its possibilities are endless and can easily become your most used cooking tool. 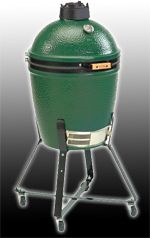 As a company, you will find very few companies as devoted to their customers as Big Green Egg. This was a principle they were founded on, and something that they pride themselves in all these years later. They stand behind their products, and believe that customer service is in their foundation. Big Green Eggs are an investment, and you can always be sure that their quality is outstanding. Available in five sizes, with more than 100 different accessories to enhance your convenience and experience, there is no other grill that can compare. Made to last a lifetime, Big Green Egg bbq parts for replacements and repair, are available and will allow you to keep yours running smoothly for many years to come. Big Green Eggs are some of the finest grills you will ever come across. Built to last, and built to perform, you will only be satisfied! This entry was posted in Big Green Egg Grills, Grill Parts, Grill Repair, Kamado Grills and tagged Big Green Egg, Big Green Egg BBQ Grills, Big Green Egg History, Big Green Egg Parts, Big Green Egg Repair, Big Green Egg Replacement Parts, Big Green Eggs. Bookmark the permalink.